James Dougherty was born on November 16, 1839, in Langhash, Ireland, and later immigrated to the United States. He enlisted in the U.S. Marine Corps on July 31, 1869, in Philadelphia, Pennsylvania, and served aboard the screw sloop USS Benicia during the Korean Expedition in 1871. Then Corporal Dougherty was awarded the Medal of Honor on February 8, 1872, for his actions aboard the Benecia during the Battle of Ganghwa in Korea on June 11, 1871. Sgt. 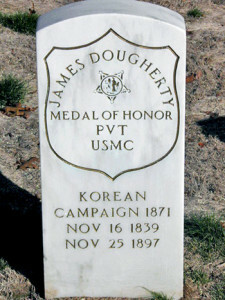 Dougherty retired from the Marine Corps on August 22, 1893, and died on November 25, 1897. He was buried at the Cypress Hill National Cemetery in Brooklyn, New York. On board the U.S.S. BENICIA, attack on and the capture of the Korean forts June 11, 1871, for seeking out and killing the commanding officer of the Korean Forces.